Thousands of Pakistanis crammed into hundreds of vehicles streamed towards Islamabad on Monday in a protest march led by a Pakistani-Canadian cleric demanding key electoral reforms. Supporters of religious leader Tahir-ul Qadri take part in a protest in Lahore, Pakistan on January 13, 2013. Thousands crammed into hundreds of vehicles streamed towards Islamabad on Monday in a protest march led by the Pakistani-Canadian cleric demanding key electoral reforms. Tahir-ul Qadri claims one million people are taking part in the rally but some witnesses put the number at 20,000-30,000, far short of the 100,000 he is estimated to have drawn at an initial rally in Lahore on December 23. Qadri, who returned from Canada only last month, accuses the government of being corrupt and incompetent. He is demanding that Pakistan enact reforms before general elections scheduled to be held by mid-May. He wants an independent caretaker government to be set up in consultation with the military and judiciary when parliament disbands in mid-March, and calls for reforms so that "honest people" can get elected to parliament. If polls are held as scheduled, it will mark the first time that a democratically elected civilian government hands over to another elected civilian government in Pakistan, which has seen four military dictators. Mainstream political parties fear that Qadri's demand for the military to have a say in the caretaker set-up, and his insistence on reforms, could prolong the interim administration and delay elections. Interior minister Rehman Malik has repeatedly warned of a terror threat to protesters and the authorities have sealed off the main approaches to Islamabad to try to stop them from entering the city centre. 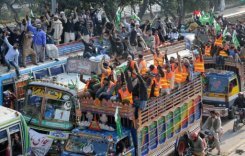 Qadri and his supporters left the eastern city of Lahore on Sunday for Islamabad and police say thousands of officers have been deployed along the route of the march. Mobile phone networks have been shut down along the route, an increasingly common precaution designed to stop the Taliban and other Islamist militant groups detonating bombs. Qadri gave his supporters a pep talk at a televised news conference in Kharian, around 140 kilometres (90 miles) south of the capital. "Come out of your homes to save Pakistan, save the future of your children, save your religion, save the honour of the country in the comity of nations, save the country from robbers, thieves and corrupt rulers," he said. "They are stealing billions of rupees of development funds and using them as political bribe and there is no room of such practice in the constitution."